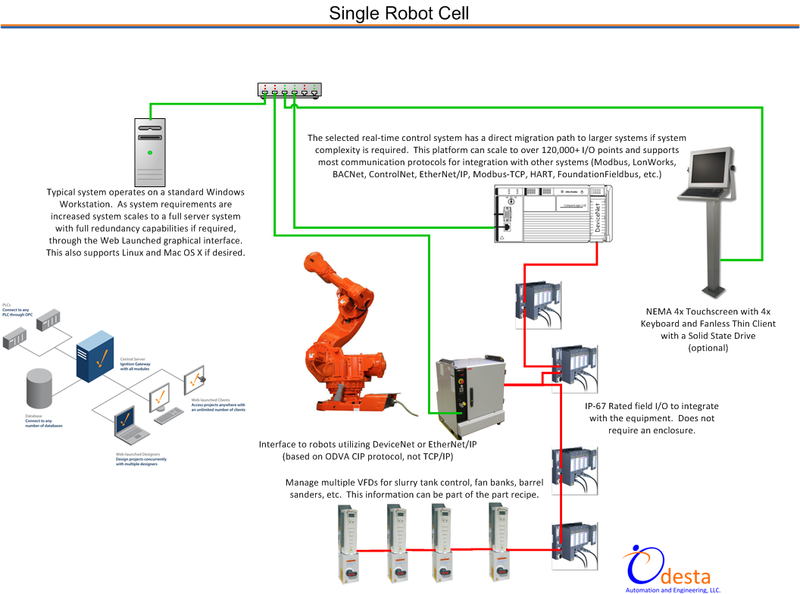 Odesta Automation and Engineering, LLC. Added some new Add On Instructions under the RSLogix 5000 section. Also available for custom Add On Instruction development for manufacturing facilities and OEMs. A very important topic these days. The US Governmental has a Control Systems Security Program that posts vulnerabilities to software and hardware typically used in industrial automation. These usually include general descriptions of the security issue and links to the vendor for more detailed information on how to implement workarounds of patches for the problem. Then for people in the utilities industry the DOE also has some specific information for your industry. Have started some general information posts on different topics. These typically include general solutions to common issues across several industries Odesta is involved in. The technologies involved include (at this point); VMWare, SQL Server and I/Gear. Check the posts out under the General Information section. Hope you find something useful. The requirements and capabilities of safety systems have drastically changed over the past several years. This has come to the forefront of several projects the past couple of years. The new programmable safety systems offer much better functional safety than in the past, better capabilities to integrate with existing or new control systems, lower wiring requirements, complete diagnostics and can increase the uptime of your equipment in complex systems. Below is a simple look at the different systems for programming a simple E-Stop with manual reset and dual monitored output contacts. In case you have not been keeping up with the security issues with HMI, SCADA and DCS systems over the past year and a half with the issue with the STUXNET worm that attacked Seimens systems. Here are a couple of links to look at that has some good information papers and potential solutions to the security issues. Of course some basic help from internal IT departments can help quite a bit by implementing VLANs and VPN access to your control networks. Check out this very cost effective network time server that uses GPS from NetBurner. You will also need to purchase the external antenna. See this link for details. Found a great open source version of a Network Time server (NTP - Network Time Protocol). A customer used this to set the time on his Cognex cameras so that if there was a power cycle the cameras would still report the correct date and time through the Cognex Software. The Cognex cameras use the simpler form, SNTP (Simple Network Time Protocol) and this works great as a basic time server. Of course they also have some high end hardware based solutions for network time servers that use GPS or other precision time sources. Data can be exported to PDF, Excel or Word. With the full version of SQL Server scheduled reports can be run and emailed to required personnel based on default report parameters. Reports can also include drill down data as shown with the data summarized by a daily average. This makes your process data easily accessible to your engineers with a basic web browser. Yet they still have the option of importing the data into Excel for additional analysis. 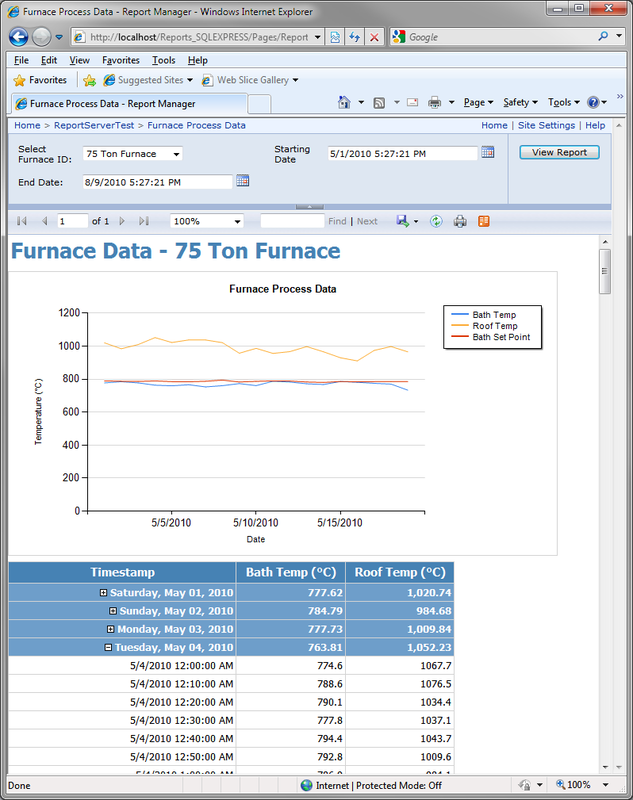 The report designer is included with the web based reporting system for installation on multiple customer machines. The reporting tool is comparable to many that are used by IT departments (Crystal Reports, MS Access, etc). Since the data is in SQL Server, it is also possible to create queries / reports from within Excel if that is more familiar. This seems to be the best way to provide the most cost effective solution that has the most active online communities for end user support beyond what Odesta is able to provide. Our goal still remains to provide a solution that the customer can extend on their own if they want to. Check out the latest version of SQL Server Express 2008 R2. Microsoft has bumped up the database size limit for the free version from 4GB to 10GB. Now quite a few of the applications for historical logging that used to require the full version of SQL Server can use the Express Version. Completing work on a shell management system for the Investment Casting industry that has a few different ideas than other systems you may have seen in the past. For a more technical description of features look on this PAGE. Graphical Interface - View a graphical view of your shell/ceramics general arrangement of the department and quickly see the status of the equipment. Part and recipe tracking - Through RFID, bar codes and conveyor position the system can maintain an accurate record of when each coat is applied, record the historical conditions of the system when the coat was applied, verify that minimum/maximum dry times are enforced, send the robot the required program number to execute, provide a rules based decision process to optimize the systems selection of which conveyor/part to coat next, etc. The system can also track the parts on a hand dip area and provide specialized instructions for the hand dip technician. Historical trending of process parameters - Trending of most any process parameter that is critical to the foundry quality. This would be items like temperature, humidity, pressures, flows, etc. If there are not any cost effective methods to automatically collect process data there are manual data entry screens available for items like slurry viscosity, plate weight and shell weight audits. Equipment diagnostics and alarming - For all equipment supplied by Odesta there will be an integrated diagnostics and alarming built-in to the control system which can be displayed on the graphical interface. For most existing equipment that is PLC based, comprehensive alarming can be added for a reasonable engineering cost. Process control - The system can be integrated with the temperature and humidity unit (desiccant or refrigeration based units) to provide remote set points, damper controls, supplemental heating, humidifier control, etc. Also includes process monitoring like chilled water flow, chilled water temperature, alarming for out of specification conditions (temperature, humidity, air flow, etc. ), monitor chiller faults, pump conditions, etc.